You can even make these ahead of time and keep them in the freezer. They bake right from frozen, and make for a very elegant (and easy) weekend breakfast or brunch treat when you’ve got company staying over! 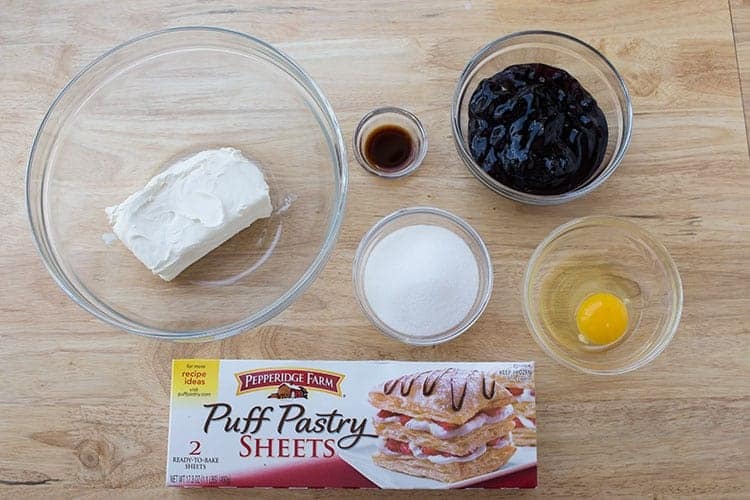 To save time, I use store-bought puff pastry. But you can make it from scratch if you’d like. If using store-bought, it will need to be thawed according to the package directions. 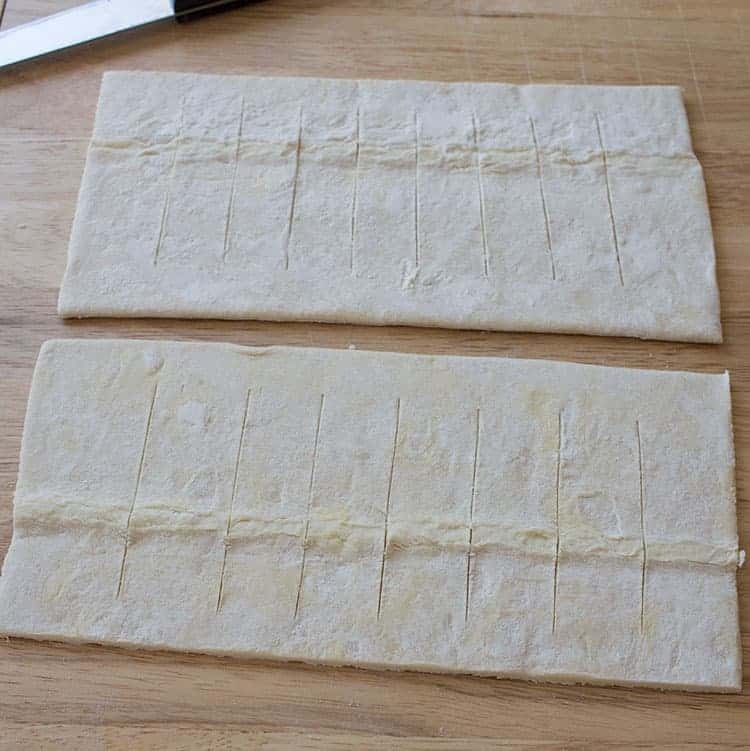 Unfold your sheets of puff pastry and cut in half lengthwise, so that you have four long rectangles. Place two of the rectangles on a baking sheet lined with parchment paper or silicone baking mat. (I’ve had my Silpat baking mats for about 10 years now, but I also use some I found at Costco and some from AmazonBasics – they all work beautifully for this sort of thing!) Set aside the other two rectangles. Mix your softened cream cheese, sugar and vanilla together in a medium bowl. Spread a thin (or thick, depending on your preference) layer of cream cheese on the pastry rectangles on your tray, up to about a half-inch away from the edge of the pastry. Then top your cream cheese layers with about 1/4 to 1/3 cup of pie filling on each, again, up to about half an inch from the edge. Crack an egg into a small bowl and mix with 1 tablespoon of water. Lightly brush the exposed edges of your pastry with the egg wash. This is to help seal the top and bottom layers together. 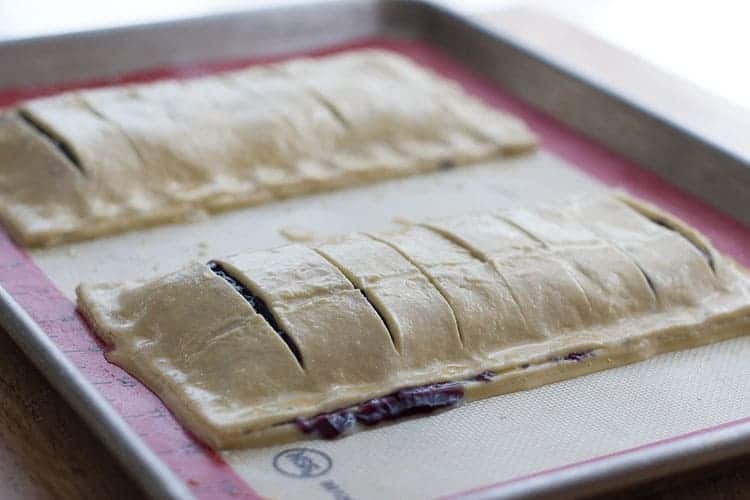 Now, take your remaining two rectangles of pastry and cut slits about an inch apart, starting and ending one inch from the outer edge, along the length of the pastry dough. Place them carefully over the tops of your filling layers, and press down the edges to seal. You can use a fork to crimp, or just use your fingertips. Brush the tops of your danishes with the remaining egg wash (discard any leftovers). This is to help give it that beautiful golden brown shine. At this point, you can either proceed to bake, or you can prep these to freeze (or bake one and freeze one for later). If freezing, I recommend doing so on a tray, lined with parchment paper or a baking mat. Stick the whole tray into the freezer for several hours or even overnight, until the danish has frozen solid. Once frozen, you can carefully remove the danish and tray from the freezer, loosely wrap the danish in wax paper or parchment paper and place in a gallon-size ziptop freezer bag to go back into the freezer. To bake, preheat your oven to 375 Fahrenheit. 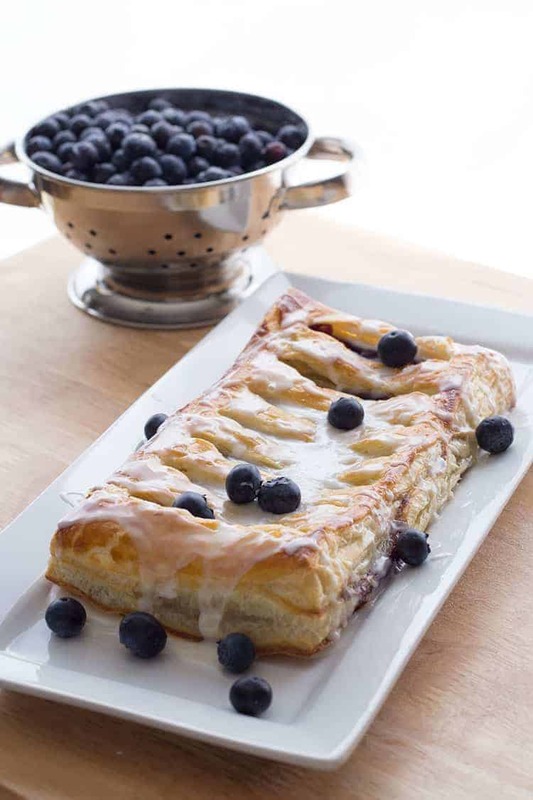 Bake danish on a parchment or silicone lined tray, 20-25 minutes (30-35 minutes if frozen), until pastry has puffed and the top is golden brown. While the danish is baking, in a small bowl whisk together powdered sugar, vanilla, and 1-2 tablespoons of milk (start with 1, and add more until it reaches the consistency you want). Drizzle over baked pastry. 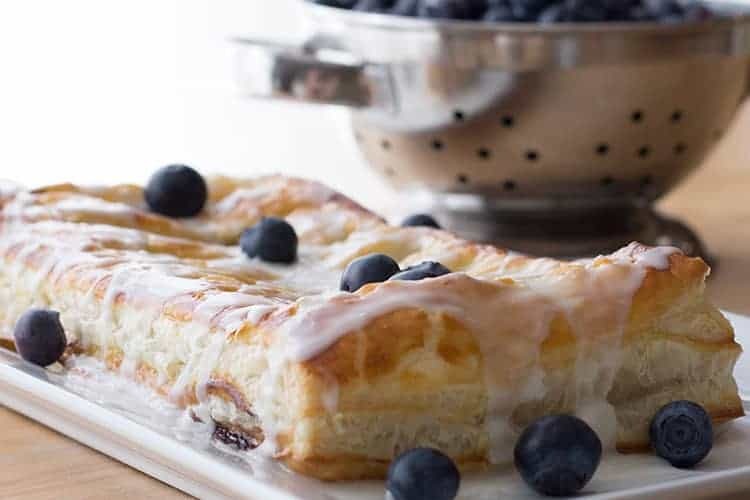 Waking up is hard sometimes, so treat yourself with this delicious blueberry cream cheese danish! Or prepare this ahead of time and pull it out to impress company for breakfast or brunch. Thaw puff pastry according to directions. You'll want it pliable but still cold. 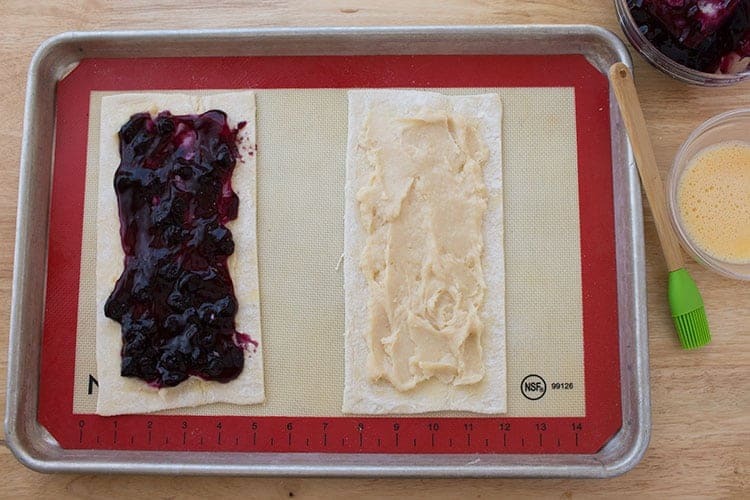 Flatten each sheet of pastry dough, and cut in half lengthwise (you'll have 4 long rectangles). Set two rectangles aside. Place the other two rectangles on a baking sheet lined with parchment paper or a silicone baking mat. Mix together cream cheese, sugar and vanilla. Divide cream cheese mixture evenly, and spread over each rectangle, leaving 1/2 inch along each edge. Divide pie filling evenly and spread lightly on top of cream cheese layers, again leaving 1/2 inch along each edge of pastry dough. In a small bowl, whisk egg with 1 tablespoon of water to make egg wash.
Lightly brush egg wash along exposed edges of filling-topped pastry dough rectangles. Set aside. 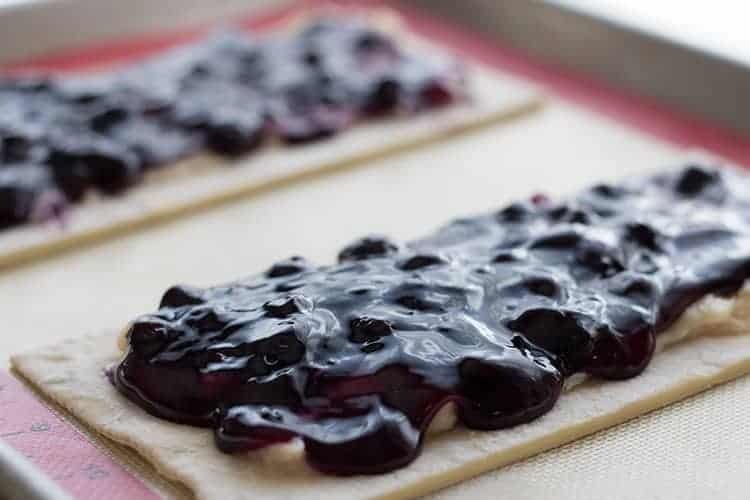 Take the two remaining pastry rectangles, and cut slits approximately 1 inch apart along center length of dough, starting and ending 1 inch from sides and edges. Gently lift rectangles and place on bottom layers, pressing edges together firmly to seal. Crimp edges with a fork, or press with fingertips. Brush egg wash over tops of danishes. Place danishes into freezer on parchment or silicone lined tray. Allow to freeze for several hours or overnight, until frozen solid. Carefully remove frozen danishes from tray, wrap loosely in parchment or wax paper, and place into labeled gallon-size freezer bag. Place back in freezer. Preheat oven to 375 degrees Fahrenheit. 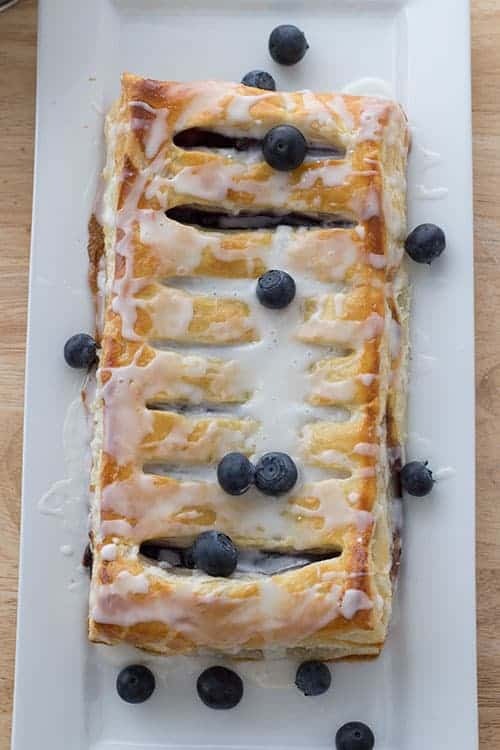 Place frozen danish(es) on baking sheet lined with parchment or silicone mat, and bake for 30-35 until pastry is fully puffed and top is golden brown. In small bowl, combine powdered sugar, milk and vanilla. (Start with 1 tablespoon of milk and add more to achieve desired consistency.) Pour icing glaze over warm danish. Serve. This looks so yummy! I live that it’s freezable! This would be really nice to make ahead next time we have company stay and then I can have a special breakfast ready to go. Love that you can freeze these too! I want to make ahead for the holidays but could you give specific instructions for baking the danish that have been frozen. Should I bake it from the frozen state or should I defrost and then bake? Since the puff pastry is frozen when purchased, I was worrying about all the freezing and defrosting it has to endure! Thanks very much for your insights! I just went back and read through the recipe and realized I had failed to specify any of that information – I’m so sorry! I appreciate you pointing that out. I usually bake the pastries directly from frozen, although you can do both. I just find it easier to bake from frozen since I rarely remember to pull them out to thaw the night before. 😉 I will go in and update the recipe card to include that. Cook’s Illustrated did some testing on puff pastry dough, specifically whether there were any ill effects of thawing and refreezing, and their tests showed there was minimal ill effect when refreezing the dough after it has been thawed. In my own tests (I used Pepperidge Farms brand), I didn’t find that there was much of a difference either after thawing, making the danishes, re-freezing and then baking. If you make some, I’d love to hear about your experience and how they turn out! I will let you know how they turn out!! Thank you so much for your prompt and thorough response…you are awesome!! I’d love to make these! How much pastries would 600g of my homemade puff pastry dough make? ?